Exclusive to Amys Gifts this bespoke embroidered train towel with a name and initial personalised to make this fun towel extra special. 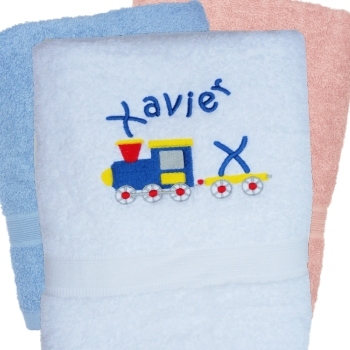 Exclusive to Amys Gifts this bespoke embroidered train towel with a name and initial personalised to make this fun towel extra special. Single Bath Towel 75x125cm. Or select a 2pc set of Bath towel and Hand towel. Choose the towel colour you prefer. Select the text thread colour you want for the name and initial. The name is sewn in kids font in a wavy style to represent the steam from the train. The first initial of the name is sewn on the train's cart.